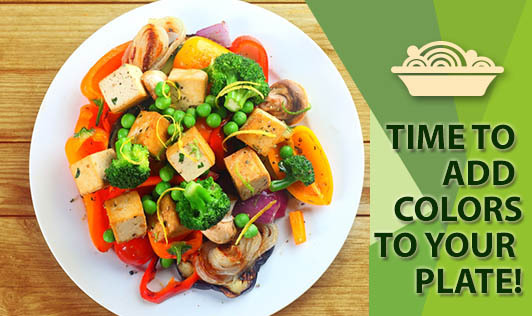 Time to Add Colors to Your Plate! It is not just the vibrant red in tomato or yellow in corn or green in spinach or purple in brinjal that these vegetables have to offer you. Each of these colored vegetables has their unique nutrients to up your wellness scales. Deeper the color of the vegetable, more nutritious it is! Wonder how? This is because, deeper pigmentation (color) score high on the antioxidant values, in turn offering higher protection against cell damage and prevention of a variety of diseases. Tomatoes, strawberries, apples and watermelons are rich in lycopene. Lycopene is known to reduce the risk of different types of cancer. Greens like cabbage, broccoli or green peas are rich in sulforaphane, isothiocyanate, and indoles that are known to assist the liver in detoxification and also produce various chemicals that prevent the onset of cancer. Onion, garlic and pears are rich in flavonoids and have high antioxidant properties that are involved in protecting the cell membranes. Black grapes and brinjal (egg plant) are rich in anthocyanin. This purple pigment is known to increase blood flow and also improve the kidney and eye functions. Oranges, papayas, carrots, musk melon, mango etc are not just brightly colored, but also improve cell functioning and aid in cell protection. So, adding that yellow condiment (turmeric) in all the curries, or eating a banana after a meal, is adding tones of carotenoids, lutein and zeaxanthin to your diet to keep your eyes healthy. So, add fresh and vibrant colors to your plate and make it look like a little piece of a rainbow to reap the benefits of a healthy meal.